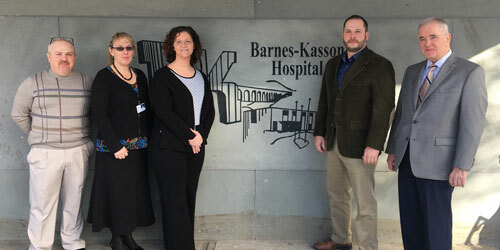 Earlier this week, I had the opportunity to tour Barnes-Kasson Hospital in Susquehanna. Our rural hospitals are critically important! I remain focused on supporting policies to ensure their continued operation. I want to sincerely thank my hosts for allowing me to tour their facility. They truly care about their patients and our community. Pictured above from left: David Passetti, Kelli Kane, Sara Adornato, me and Charlie Alison. Congratulations to Paul Lukus on his 40 years of service to the Susquehanna County Housing and Redevelopment Authority. Paul is a great example of one who dedicates his time to our community. Pictured from left: me, Susquehanna County Commissioner MaryAnn Warren, Authority Executive Director Karen Allen, Paul Lukus, and Susquehanna County Commissioners Alan Hall and Betsy Arnold. I am excited to continue serving on the Aging and Older Adult Services and Commerce committees this session as well as being newly appointed to the Environmental Resources and Energy Committee. My priorities for Commerce and Aging and Older Adult Services include ensuring protections and stability for Pennsylvania companies and continuing to advocate for legislation that will improve senior services for our elderly community. As for the Environmental Resources and Energy Committee, my goal is to help strike the proper balance between advancing industry and attracting business while ensuring there are prudent safeguards to protect the environment. You can watch the address on my website repfritzpa.com at 11:30 a.m. and keep your eyes on my social media for updates and reactions. Applications for the Property Tax/Rent Rebate Program are now available on my website and at my district offices.